I must ask you to join me in the disorder of crates that have been wrenched open, the air saturated with the dust of wood, the floor covered with torn paper, to join me among piles of volumes that are seeing daylight again after two years of darkness, so that you may be ready to share with me a bit of the mood—it is certainly not an elegiac mood but, rather, one of anticipation—which these books arouse in a genuine collector. For such a man is speaking to you, and on closer scrutiny he proves to be speaking only about himself. A collection, Walter Benjamin suggests, is nothing less than an identity. A character demonstrates the point in Stephen Frears’s film High Fidelity, based on Nick Hornby’s novel. After a bad breakup, John Cusack’s eerily accurate record-collector protagonist reorganizes his collection, not alphabetically or chronologically, but autobiographically. As I write this, my parents are packing up everything in their house for storage. They’ve decided to spend their last few years before retirement living and working in Karachi, Pakistan, where they were both born. I took a bus from New York to Pennsylvania to do my part, as my brother would from California later in the summer. My mother had already warned me that my primary contribution would be packing my library. My own library does not consist of books or records, but the less fashionable medium of CDs, having been initiated after the death of vinyl and before its alleged rebirth. I built up the collection feverishly in my youth, no small feat in the cultural vacuum of State College, Pennsylvania, where I grew up. Its growth tapered off only when, in my mid-twenties, I moved into a sardine can in Brooklyn too small to hold it. The larger part of it lay scattered through my childhood bedroom—in the bookcase, in the closet, in milk crates and obsolete IKEA containers on the floor—until I returned earlier this year to put it in order. When laid out together, the CDs attain a volume too large to fit in the trunk of a car. As Benjamin unpacks his own library, the history of each book’s acquisition strikes root. Every bookstore and auction house is a landmark on a path traveled through cities —“Riga, Naples, Munich, Danzig, Moscow, Florence, Basel, Paris”—on the route of aimless urban wandering Benjamin would come to see as the essence of modernity. Benjamin’s collection wasn’t just an autobiography. Unpacking it was the writing of intellectual history. It was a coincidence that the excavation of my own collection began on my 29th birthday. It was also my brother’s birthday, which was not a coincidence. Birthdays are a peculiar occasion for twins, and my brother and I still feel uncomfortable wishing each other happy birthday. It always seems like an exercise in redundancy, impossible to carry out without a touch of irony. “Happy birthday, I guess,” I texted him from the bus to Pennsylvania. “You too, I guess,” he replied. The first birthday that we exchanged gifts, our eleventh, was also the last. It was probably difficult even for our parents to choose gifts for us—though we were atypically reluctant, for American kids, to put away childish things, toys and sheet cake had worn out their welcome by the time we turned ten. Our parents had the idea, which we were too naive to be appropriately mortified by, that we still needed a babysitter. She was an effervescent young woman named Jennifer, a student of my father’s at Penn State, where he taught architecture. I remember very little about her, except that she let us watch cartoons when we were supposed to be doing our homework, and that she happened to be a Beatles fan. In an act of charity the magnitude of which she will never know, she dubbed a cassette tape for my brother and me with Abbey Road on one side and Let it Be on the other. Never mind that the latter is the worst of the dozen albums they released; for reasons not entirely musical, my brother and I became obsessed with the Beatles. We may not have been aware of the pop music of the time, but we loved movies, particularly comedies. We became such dedicated Beatles fans that we watched not only A Hard Day’s Night but also its witless sequel Help! repeatedly. By the time our birthday came around, the decision had been made that we should treat each other more like ordinary siblings. I don’t remember what sort of gift I got my brother, but I knew in advance what he was going to get me. My interest in music had surpassed his. It had led me to checking out tapes and CDs from the local public library. After I had filled in the gaps in the Beatles’ catalogue, I moved on to earlier classics like Chuck Berry is On Top, Here’s Little Richard, Dance Album of Carl Perkins, and others containing songs they had covered during their clean-shaven period. Since I had to give these all back after a couple weeks, it was a natural choice on my brother’s part to get me my own copies of the soundtracks to A Hard Day’s Night and Help!, on the then-cutting edge medium of four-and-three-quarter-inch compact disc. Lines began to be drawn, and not a moment too soon. Healthy separation from their families of origin takes an extra step for twins, which, in our case, strained fraternal bonds. “In ordinary circumstances, and with ordinary good management, infants start immediately after birth to form the basis of their personalities and of their individuality, and to discover their own importance,” Winnicott says. This is permitted by what he calls “primary selfishness,” the desire and expectation in infancy that one’s needs are immediately met by the mother. In twins, unfortunately, “it is impossible for one mother to meet two infants’ needs at once,” he drily observes. This impasse puts twin relationships on a pendulum that swings precipitously between the urge to share and the hunger to compete. My brother started to take more of an interest in books, which handily won my mother’s approval. I took after my father. His love of music was confined to a single era, yet already owning everything it comprised diminished none of his fervor to collect. Trips to bigger cities invariably required crate-digging detours to local Indian and Pakistani neighborhoods, smelling of sandalwood and garam masala, where not a word of English was spoken. “Every passion borders on the chaotic,” says Benjamin, “but the collector’s passion borders on the chaos of memories.” Nostalgia for the music of one’s youth is universal; for an expatriate like my father, homesickness complicates and intensifies its power. Harvey Pekar had to rely on print auctions and sales lists. I had the internet. I overdrew my bank account on a regular basis, and my aggrieved mother had to bail me out every time. She must have known she had signed on to start a family with one obsessional neurotic, but she couldn’t have expected to end up with a second. “It’s so hard for anyone but another collector to understand why you can’t kick the habit,” says Pekar. Silently, my father and I understood one another. Though the compulsion to buy could be self-destructive, its result was divine creation. Immersed in a universe of my own making, I gazed at cover art, pored over liner notes, checked and compared dates. Most of all, I scanned for overlapping credits—a pleasure that reaches its zenith for the jazz collector, given the collaborative nature of the form. “For a true collector,” says Benjamin, “the whole background of an item adds up to a magic encyclopedia whose quintessence is the fate of his object.” Besides furnishing historical detail, these clues facilitate more collecting. There’s an unequaled thrill you get when you cross the line from learning about a subject to knowing it, like when you first get a sense of direction in a new neighborhood. I sought this sensation endlessly. I delved into an unfamiliar genre every time I’d sketched out a crude map of a previous one. Many collectors of my generation got their start rifling through their parents’ old records, but my father’s collection was the music of a foreign country. I saw my collection, on the other hand, as my chance to escape the confines of heritage. I returned to the public library for guidance. Flipping through the CD stacks, I saw Elvis Costello sneering back from the cover of This Year’s Model, skinny and bespectacled like me, and recognized a kindred spirit. I came across the blue-tinted photograph on the cover of Grant Green’s Idle Moments, like a still from a film noir, and took it home to solve the mystery. From these landmarks, I drifted further into uncharted territories, worlds beyond the football fields and fraternities of my small college town. After hearing a Parliament compilation I had checked out on a whim, I walked downtown to my favorite record store and bought their first masterpiece, Mothership Connection. My brother and I listened to it that same night, inappropriately quietly, because we were supposed to be sleeping. From the coy opening bars of its first track, “P-Funk (Wants to Get Funked Up),” it was a revelation; at once earthy and futuristic, crass and sophisticated, corporal and cerebral, a silly joke and a philosophical argument. It was better than The Beatles. As the last strains of “Night of the Thumpasorus Peoples,” its aptly titled final track, faded out, I asked my brother if he minded if I played the whole thing again. He didn’t. Not long after, our parents finally noticed that we needed separate rooms—he moved into the guest bedroom, with a bookshelf and television, and I stayed, with a digital alarm clock that had a built-in CD drive. The summer after I turned sixteen, I saved up from my job flipping burgers and bought some studio-quality Sony headphones I could crank at full blast. To my mother’s chagrin, I began to spend most of my time between them. Which means, of course, that I wasn’t paying much attention to the outside world. I was an introverted kid, and I sublimated my social and libidinal drives into my collection—a tendency that emerged at the same moment as the collection itself. One day after school, back at the age of eleven or twelve, I had enjoyed the privilege of seeing inside Jennifer’s personal locker at her campus studio. Alongside the Beatles catalogue, I noticed another tape: George Michael’s Faith. I checked it out from the library, and if the album as a whole isn’t quite at the level of Abbey Road, the slyly suggestive title track is at least as good as any of its songs. It aroused such tantalizing feelings in me that I have to consider hearing it my first sexual experience. As the years passed, it would be joined by Liz Phair’s “Flower,” The Pixies’ “Gigantic,” the entire Prince catalogue, and a series of other songs alluding to an act in which I had not yet participated, substituting for it as long as a substitute was necessary. If I don’t hear music as intensely now as I did then, it’s not much of a loss—after you’ve finally managed to have a real-life sexual encounter, you don’t need a song to serve as a placeholder. Music means a great deal to me now, but then, it meant everything at once. And yet, music collectors are something other than just music lovers. We have a quality in common with collectors of rare books, or antique furniture, or baseball cards, or anything at all. It’s the mood of anticipation Benjamin describes a collection awakening in its owner, that of a self coming into being. I put together a collection that I imagined would belong to the person I wanted to become. The resulting library is large, and contains multitudes. 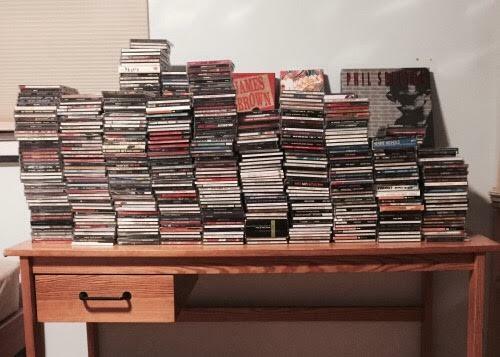 Four days after my birthday, I had sorted through 1,017 CDs. That number doesn’t include duplicates that I bought without realizing: The Jam’s All Mod Cons, The Zombies’ Odessey and Oracle, Richard & Linda Thompson’s Shoot Out the Lights, Frank Sinatra’s In the Wee Small Hours, Prince Paul’s A Prince Among Thieves, Fiona Apple’s Extraordinary Machine, Tricky’s Maxinquaye, and Shania Twain’s Come On Over—all masterpieces (ask me sometime and I’ll gladly argue my case for that last one). Nor does it include nearly fifty CDs that I don’t want and don’t remember buying. I packed every last one in cardboard boxes, and stacked them in the room designated by my parents for storage—my brother’s old bedroom. The total number isn’t likely to increase by much—needless to say, the CD market isn’t what it used to be. The record stores I spent whole afternoons in as a teenager have long since closed down. I took to Napster quickly, followed by Pirate Bay, followed by the dearly departed Megaupload. At first, I considered these intermediaries, temporary trial periods before I would eventually shell out cold hard cash for the genuine article. But I finally caught up to the rest of the world, and I no longer require music to take material form. The increased speed and decreased size of data storage have irrevocably altered the nature of collecting—streaming services like Spotify give us access to a shared archive, that, hypothetically, contains everything. It’s a condition as overwhelming and impersonal as it is exciting. “Even though public collections may be less objectionable socially and more useful academically than private collections,” says Benjamin, “the objects get their due only in the latter.” Can there be collections without objects? Ours is an age of mechanical reproduction even a philosopher of Benjamin’s prescience could not have predicted. If the 20th century eliminated the aura of the object, the 21st has eliminated the object itself. The record collection, you might say, has given way to the playlist. But collections were never just groups of similar objects assembled in the same location. They were clusters of knowledge, unified by a series of contingent events and subjective decisions in the lives of their owners—places traveled, relationships failed, money lost. They proved that we really existed. “The chance, the fate that suffuse the past before my eyes are conspicuously present in the accustomed confusion of these books,” says Benjamin of regarding his library. If sorting my collection amounted to reading my autobiography, packing it up in boxes felt like I was euthanizing it, as though it were an aging pet that had to be put down. But it survived the procedure. Even now I sometimes find myself wanting to listen to something that the internet, in all its omniscience, has failed to make available. For instance, western swing guitarist Jimmie Rivers’s sole release, Brisbane Bop, recorded live at the 23 Club, on a night when the dinner special was buffalo burgers. Or jazz piano eccentric Mal Waldron’s What it Is, released on the small German label Enja in 1981, during the low point of jazz’s popularity in its own homeland. Or unheralded R&B heroes The “5” Royales’ out-of-print anthology Monkey Hips and Rice, its contents artisanally handpicked by historian Ed Ward. I buy a CD, and my collection grows. My birthday, and my brother’s birthday, is its birthday too. It turned 18 this year. Shuja Haider is a writer and musician based in Brooklyn. He is a contributing editor at Viewpoint Magazine and is the guitarist and songwriter of The Bad New Ones.